ENGLEWOOD, Colo. (AP) — Pat Bowlen’s nomination for the Pro Football Hall of Fame is a jolt of good news for a franchise that’s had little to cheer in the 30 months since winning Super Bowl 50. Peyton Manning retired. Gary Kubiak resigned. Paxton Lynch flopped. The Broncos have lost 18 times over the last two seasons and went 5-11 in coach Vance Joseph’s first year in 2017. Last month, Bowlen’s wife, Annabel, announced she has Alzheimer’s, a disease which led her husband to give up control of the team four years ago, and earlier this month former personnel executive Tom Heckert died at 51 following a long illness. On Thursday, Bowlen and Gil Brandt were nominated for enshrinement in Canton as contributors to the game. To get in, they need fourth-fifths of the vote from a 48-member panel that will meet on the eve of the Super Bowl in Atlanta in February. In recent years, Bowlen has seen several of his former players get into the Hall of Fame , including Terrell Davis, Gary Zimmerman and Shannon Sharpe. Bowlen’s credentials include both on-field success and behind-the-scenes triumphs. He was the first NFL owner to win 300 games, including playoffs, in his first three decades and he has more Super Bowl appearances (seven) than losing seasons (six) since buying the team in 1984. Under his stewardship, the Broncos have won Super Bowls following the 1997, 1998 and 2015 seasons. He also chaired 15 NFL committees, more than any other owner except for Hall of Famers Dan Rooney (18) and Lamar Hunt (16). Bowlen helped negotiate record-breaking TV contracts as chairman of the NFL Broadcasting Committee and as a member of the NFL Management Executive Committee he’s helped the league enjoy decades of labor peace. The Broncos have averaged 10.2 wins a year in 34 seasons under Bowlen, whose 348 wins are fifth all-time among owners. During his tenure, the Broncos have posted the second-best regular season winning percentage (.603) in the league and the third-best mark among all 122 major North American sports teams. 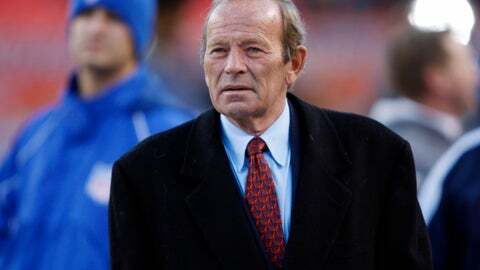 Bowlen has never had consecutive losing seasons in his tenure and is the only NFL owner to reach the Super Bowl with four different head coaches. Following Denver’s 31-24 victory over Green Bay for the franchise’s first championship, Bowlen famously hollered, “This one’s for John!” something the Hall of Fame QB called the greatest moment of his playing career. That came 18 months after Alzheimer’s forced Bowlen to step down from his daily duties running the team. Only a handful of current Broncos — Von Miller, Chris Harris Jr., Demaryius Thomas, Derek Wolfe and Brandon Marshall — were on the roster when Bowlen was still making daily treks to team headquarters.